This combination might well turn out to be legendary. It doesn’t get much better in this sport than an Oscar-winning Hollywood actor and a veteran, high-profile coach teaming up in Australia’s National Rugby League. So far Russell Crowe and Wayne Bennett are doing OK as an owner-coach combination, which some may consider to be two beautiful minds in a gladiatorial kind of sport. It’s only three matches into the new season, but the Bennett-coached and Crowe-owned South Sydney Rabbitohs are one of only two unbeaten teams along with the Melbourne Storm. Bennett, who will turn 70 next New Year’s Day, is regarded as one of the greatest coaches of all time, having coached more than 800 top-flight games since 1987 and winning more than 500 of those. He’s won an NRL-record seven premierships — six of them at the Brisbane Broncos, where he was the foundation coach, and one with the Dragons. He also has won the annual State of Origin series with Queensland and the World Cup with Australia. And he’s also had success working with the national teams New Zealand and England, jobs he says he took to ensure the international health of the game. After 25 seasons across two stints with the Broncos, though, his tenure with the Queensland state-based club ended in rather unceremonious circumstances. 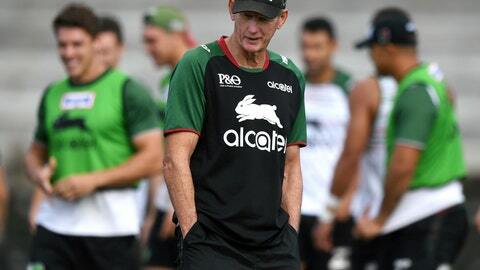 After a month of back-and-forth media speculation last November, it turned out to be a coaching swap — Bennett moved to the Rabbitohs and the then-South Sydney coach Anthony Seibold moved to the Broncos. Seibold and the Broncos have won one match and lost two to start the season. Brisbane Broncos chief executive Paul White, upset by media reports that Bennett had already been speaking to South Sydney players well ahead of the expected coaching change, fired Bennett by voice-mail. “I made multiple phone calls and I unfortunately had to communicate that decision via voice message and then over email,” White said. South Sydney is as well. Australian media reports that the Rabbitohs, known as the “Bunnies,” have picked up several million dollars in new sponsorships since Bennett’s move was announced, as well as several thousand new season ticket holders. None of that would come from Bennett’s pronouncements as coach. He has an avowed dislike of his media commitments, and the media in general. Whoever invented the word “taciturn” might have been thinking of Bennett, a country boy who moved to Brisbane to further his playing career before cutting his teeth in coaching with the Queensland Police Academy team. But Bennett, who signed a two-year deal, was glowing in his praise of Crowe. Crowe, who was overseas shooting a movie, left the negotiations for acquiring Bennett to Souths’ general manager of football Shane Richardson. “I love what he’s done for the club,” Bennett told Fairfax Media about Crowe. “Without his support, South Sydney wouldn’t be where they are today. South Sydney, one of the oldest rugby league clubs in the world, spent two years in NRL exile in 2000 and 2001 as the sport’s administrators tried to restructure a national competition that had high concentration of teams based in Australia’s biggest city. But financial support, a public groundswell and successful court challenge helped get them back into the league. Crowe’s love of the sport had a lot to do with that once he took over part-ownership of the team in the wake of its reinstatement into the league. “I admire people for doing that. It’s like when the Broncos started, the original four directors came in there and put it all on the line. That’s what Russell has done,” with South Sydney, Bennett said. Fans of both teams will be looking to two dates in May when the clubs meet for the first time this season. The Broncos travel to play the Rabbitohs at Sydney’s Olympic stadium on May 2, and the teams have a return date in Brisbane on May 17. By then, Bennett and Crowe may have had a chance to enhance their star-power status as a serious force in this year’s NRL competition.